Vierra Rose Fun t-shirt dress. 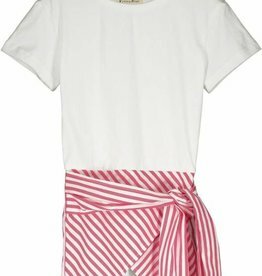 White short sleeve knit tee top with woven rose and white stripe waist-tied skirt. Tee dress look at hemline. Perfect summer look! 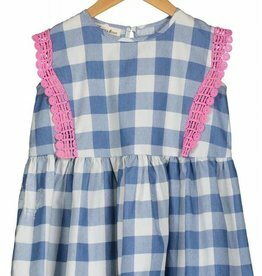 Sleeveless dress in blue check with pink lace trim on bodice sides. Gathered waist. Button closure.